A Drummond Island adventure that rocks! 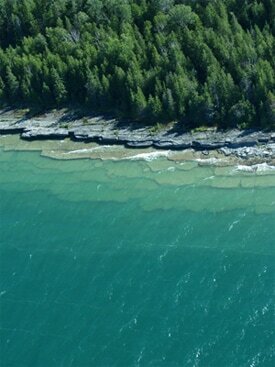 On the north shore of Drummond Island you will find the fossil ledges. The “ledges” are made up of the fossilized remains of a salt water coral bed. The "Ledges" is a unique place formed by nature that not many people know about or get to visit. The journey there can be a bit tricky, so be prepared for some off-roading. However, it is worth your while if you have a vehicle with high clearance. To To get to the Ledges you must have specific directions, we don’t want you to get lost or stray onto private property. Other points we ask you: are you mountain biking, hiking, or driving (We need to know about your car; 2-wheel drive, 4-wheel drive, high or low under frame.) We will not suggest you go to the Ledges if you do not have the proper transportation. 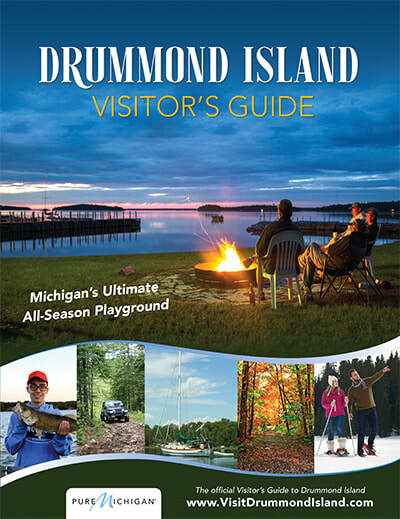 Our desire is to have you enjoy your vacation on Drummond Island. The hard-packed gravel road can be rutted from winter snow melt or heavy spring rains. There is very little mud here, just sand and stones. We will caution you about driving through the wet ruts so you do not cut a tire on a stone or hit the bottom of your under frame. We know this sounds very dire, and cumbersome, but we want you to enjoy a great sight on our Island. From the Four Corners go north on Townline Road, turn right onto Maxton Road, travel 8 miles to the Interpretive Signs for the Maxton Plains. At the 3 Interpretive Signs turn right onto Colton Bay Road (3.2 miles-the road was good to this junction). At this point bear left and go past Scott’s Camp (on your right), again bear left at the Raynolds Bay Road (at 4.1 miles on your odometer). After Raynolds Bay Road and the swamp take the first right hand turn (6.0 miles on your odometer) onto a seldom used two track to the cobblestone parking area (.1 miles). Park your bike or car and walk toward the beach (about 35 feet). You have arrived . We assure you the trip from the Interpretive Signs to the Ledges will take 45 minutes. The mileage from Four Corners to the Ledges is 15 miles. Let’s hope you saw many birds, deer, sandhill cranes and possibly a bear on this journey. When you get on the Ledges beach turn right, go about 30 feet and look at the large limestone outcropping, up about 4 feet-find the five or six orange salt water fossils in the shape of fans. You can walk the beach for ¾ to one mile, look at all the broken stones, pick them up and see the many salt water plant and animal fossils. Another great feature is the rock ledges, stair-stepping out into the water. Watch your children and pets: this water drops off to 69 feet. This is also a great place for kayakers to launch and inspect the ledges from the water. To preserve this wonderful natural scene, please take pictures, not souvenirs.